All available chairs were in use for this very special presentation by local sailmaker par excellence , Michele Stevens. The sails made in her Sail Loft at the end of Second Peninsula are known and prized internationally. Michael Ernst, RDC Chair, welcomed all present and directed audience attention to the fascinating photos and artifacts which Michele had brought to illustrate her presentation. John Meisner, MICA Chair, also extended his welcome, while updating everyone present on MICA's progress over the last year. 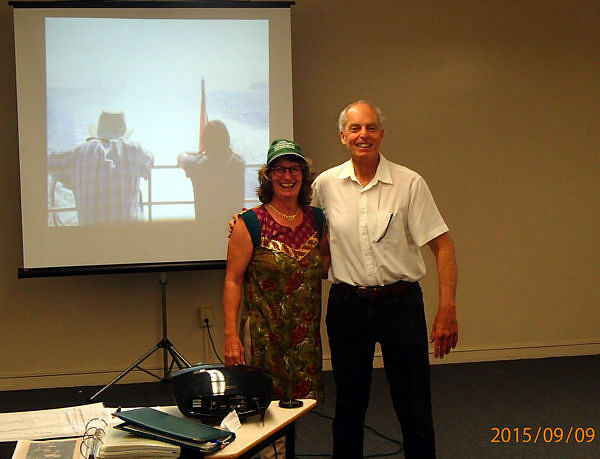 Michele presented her fascinating history of the five generations of sailmaking in her family through a slide show and references to her artifacts. Her talk was followed by questions from the audience, after which she was given a MICA cap as a thank-you gesture. Videographer Tim Reeves-Horton from Lighthouse Now captured some of the presentation to use as part of a video of Michele's history and Sail Loft workings, Making it Last, which is available to view here. Thank you, Michele: you gave us all a wonderful evening!